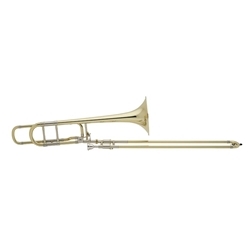 A best-seller in its class, the Bach 42BO Stradivarius Series F Attachment Trombone is great for both advanced students and professional trombonists alike. An open wrap design results in fewer bends in the tubing, which creates a free-blowing trombone. The 42BO with a .547-inch bore and 8.5-inch bell produces a large, symphonic sound with clear projection. Included with this Bach Stradivarius F Attachment Trombone is a case and mouthpiece. The 42BO Series features an open wrap F attachment section. The open wrap offers a more uniform sound, so when the trombone player uses the F attachment the sound is not different from the sound of the trombone without engaging the trigger. Bach Stradivarius trombones are famous for their fullness of sound and projection. This is achieved by use of one-piece construction, allowing for unrestricted vibration of the bell.